Obedience to the Lord and fulfillment of their covenant obligations would secure for them the distinction of being a kingdom of priests and a holy nation set apart for God. The opportunity was there for Israel because this was the Lord's purpose for them in his plan. As a “kingdom of priests” each Israelite would have direct access to God to mediate on behalf of himself and others before the throne of God, but also, each Israelite would be the Lord’s representative on earth and would speak for the Lord and teach others about the Lord and his ways (presumably, teach people from the other nations, since everyone in Israel would already be a priest). As “a holy nation” Israel would be entirely set apart for service to and for the Lord. The word “holy” means “set apart.” Israel would be “set apart” from the other nations to serve God. And, because of this, they would need to live in such a way that their lives and their culture indicated they had been “set apart,” or to show that they were “holy.” So, as a holy nation, they would have to live in a holy way. As a believer in Jesus Christ I have been included in the body of Christ, which is his church, to be a royal priesthood and a holy nation. (First Peter 2:9) Do I represent the Lord to others? Do I intercede for others before the Lord? Is my life set apart for service to the Lord? Do I live in such a way as to indicate that I am set apart? 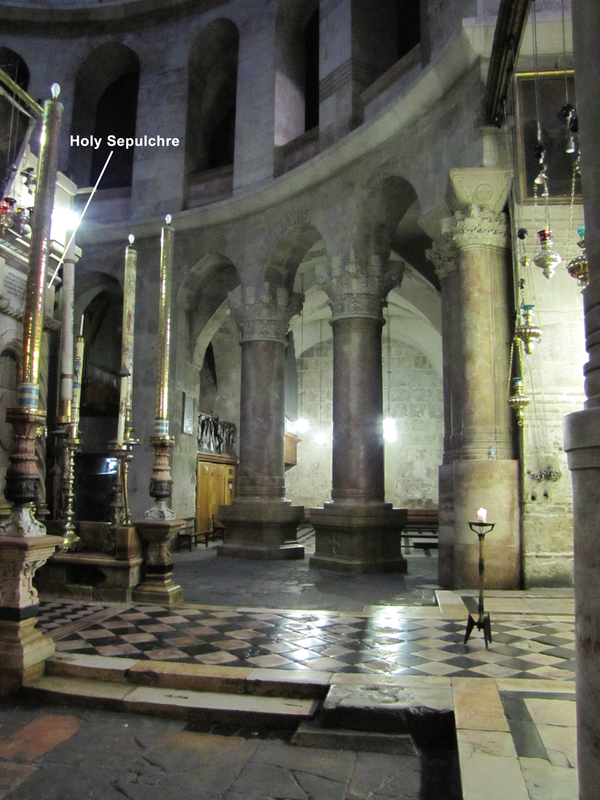 Inside the Church of the Holy Sepulcher in the rotunda. 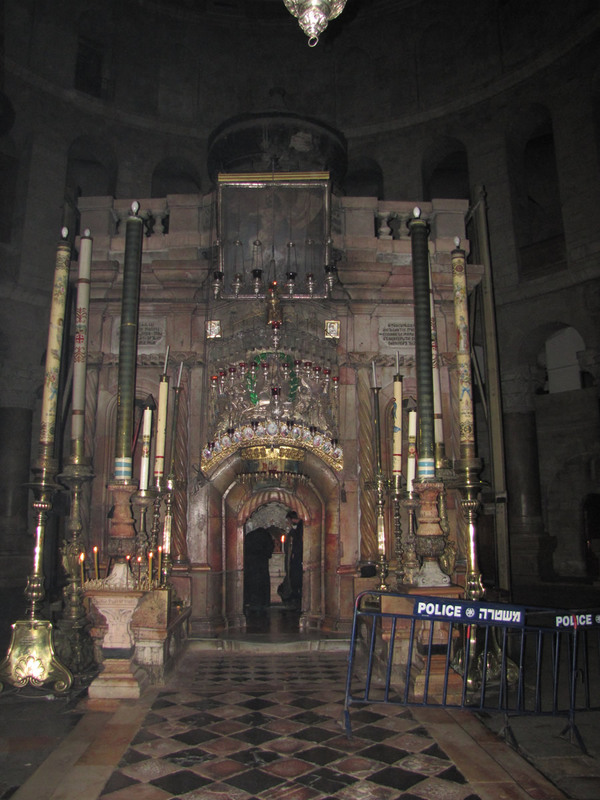 This is the area directly infront of the door leading into the tomb of Christ. Details of Ezekiel 38 and 39 diagramed on a map. 1 Asked sinners to stand up at the end of a message to be led in the “sinner’s prayer” for salvation. The "Way of the Philistines" referred to in Exodus 13:17 is said to be too dangerous for Moses to use during the Exodus. Exodus says that Israel would surely have faced war and turned back. The Egyptian Temple at Karnak depicts the "Way of the Philistines" called by the Egyptians as "The Way of Horus." The wall relief shows details of this map which include eleven Egyptian fortresses defending the route and the Egyptian border with Canaan. If Moses had used this route he would have had to fight his way out of Egypt. So, instead, God led them into the wilderness through the Red Sea. Self-centeredness is as restricting as self-forgetfulness is freeing in the process of accomplishing significant things. 2 God also said to Moses, “I am the Lord. 3 I appeared to Abraham, to Isaac and to Jacob as God Almighty, but by my name the Lord I did not make myself fully known to them. 4 I also established my covenant with them to give them the land of Canaan, where they resided as foreigners. 5 Moreover, I have heard the groaning of the Israelites, whom the Egyptians are enslaving, and I have remembered my covenant.